Have you ever pulled an all-nighter? Have you ever been encouraged to pull one — even two — in a row, by a sponsored organization? What if doing so could earn you a job? In the past few years, “hacking”— the art of designing, building and marketing an app or website from scratch within either 24 or 36 hours in a grand event referred to as a “hackathon” — has become intertwined with computer science culture among college students. Every year, it continues to increase in both popularity and significance: Major League Hacking, the main organization targeting students that helps run hackathons, helps put together more than 200 events every year. For those looking to get into tech industry, taking the prerequisite CS courses and performing well in them isn’t enough anymore; hackathons have become one of the primary avenues for students to show that they genuinely love programming, are motivated enough to go far beyond the bare minimum and have the creativity and skill to make their ideas come to life. Companies, colleges and even high schools are now hosting their own hackathons, luring attendees with a variety of free sponsor-branded “swag,” food (and caffeine), Wi-Fi and, often, subsidized transportation to and from the event. Once sufficiently convinced hackers arrive, adrenaline — along with a healthy dose of a disregard for personal health — fuels them through the weekend; at YHack (held annually at Yale), I witnessed Red Bull representatives walk around toting backpacks filled with caffeine at 3 a.m., weaving between cluttered tables and offering unlimited cans in a multitude of flavors to tired coders with a bright smile. 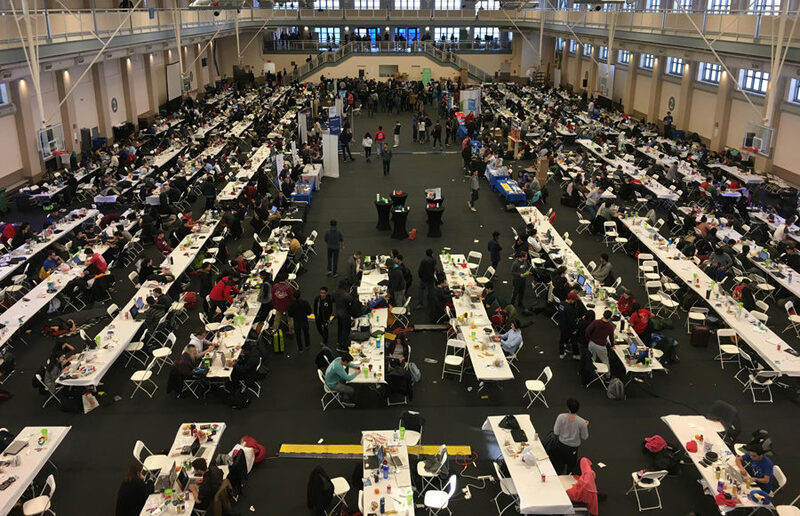 UC Berkeley’s own CalHacks, which drew 2000 people from around the globe this year, took this a step further, putting out endless bottles of extra-strength 5-hour Energy and offering large cans of yerba mate alongside the classic Red Bull. Midnight and early-morning snacks are always provided, and there’s typically a fair share of interesting events put on by the organizers, including CS rap battles, raffles for some cool technology and cup-stacking competitions. Another popular activity is people-watching — the variety of abounding nap poses, from people slumped over their laptops to people on their backs under tables, is astounding. Beyond this and the general wacky fun that can come with staying up late with friends, there’s a professional side to hackathons as well. Ultimately, the hackers are utilizing these companies’ products, will be judged by the companies’ representatives and are aiming to win the companies’ sponsored prizes. So what’s in it for the companies? Why continue pouring money into hackathons? First, there’s crowdsourcing: Just by looking at the ideas and apps hackers come up with, sponsors can not only get ideas for new products or functionalities to develop in-house, but also get a general sense of what’s “big” right now — what people most want developed. Second, by sponsoring prizes for the best usage of their own products, companies are encouraging the adoption of said products, hoping that hackers will use those products in the future and bring them into the mainstream. Third, companies, especially small ones, can get themselves known so that more people apply for their programs and, more importantly, so that they can directly recruit top engineering talent. To programmers, this means opportunity: hackathons provide a rare chance to interact directly with technicians from a variety of different companies, whether it be asking for a help with software the company itself developed, growing their professional network or impressing companies who might then be interested in hiring them. But what hackathons are — at the most fundamental level — raises plenty of thorny questions worth thinking about. Can true innovation be produced in just 36 hours? How can good, reasonable solutions to complex issues be developed and prototyped within a single weekend? How many teams actually go and further develop their product at the end of the hackathon — and how many “game-changing” apps are ever finished and tested and ready for the general public? In short, what kind of social change can a hackathon actually have? The implications of these questions start to strip away the golden image hackathons have cultivated over the years as “innovation hotspots.” While a fun weekend for participants, the products they showcase at the end of the hackathon are all presented and advertised to seem like they’re “the solution” to the problem they’re addressing — but they often aren’t nearly as polished as they’re made out to be. The unspoken axiom among hackers is that what matters more than making a fully working app is producing one that seems impressive and is able to be showcased to judges. It’s more important, for example, to comprehensively develop many functionalities for a single item that can be shown off than to make the other items actually work — the trick is to make it seem like they’re all functional. In the end, the products developed are prototypes, and there are almost always bugs that are glossed over. Despite what grand plans hackers say they have to revisit the product and fix the errors, few ever actually follow up on them. Many participants don’t care as much about making a world-changing app as they do about winning a prize and putting it on their resume, but this trend is largely a consequence of the structure of hackathons themselves. Another issue that arises is the ethicality of the produced code: Oftentimes, because of the strict time constraints, many snippets of the final code are actually taken off of the internet. This is a pretty commonly accepted practice, but it does raise the question: If you were to get a job offer from a company based on your product and the code you supposedly wrote, would it really be fair to accept the offer if you didn’t even write a large portion of the code? Where is the line between plagiarism and building on open-source software? These are all questions that the hacking community should be thinking more about. Hackathons aren’t perfect, but at the end of the day, I and other hackers keep coming back for more. It’s a strange feeling when it’s 4 a.m., you’re desperately trying to learn some new language, you’re surrounded by people doing the same, and you’re all running on ungodly amounts of caffeine and sugar — people tend to be friendly at that point of depravity. Maybe that’s why we like it so much. Contact Candace Chiang at [email protected] and follow her on Twitter at @candace_chiang.